White supremacist groups in Southern California, and throughout the United States, have reportedly been hanging hateful, antisemitic, and anti-immigrant banners on rooftops and across freeway overpasses to recruit more members for the past 10 months. According to a report released by the Anti-Defamation League’s Center on Extremism on March 16, these groups placed banners to recruit for their ideology on at least 72 instances between May 2017 and March 2018. Oregon reportedly led all states with the highest number of antisemitic, anti-immigrant banners, followed by California, Texas, and Georgia, which were tied forsecond place. From Seattle to Orlando and Los Angeles to Boston, white supremacists are displaying large banners from highway overpasses and in other highly visible locations as part of an effort to promote their groups and ideologies. 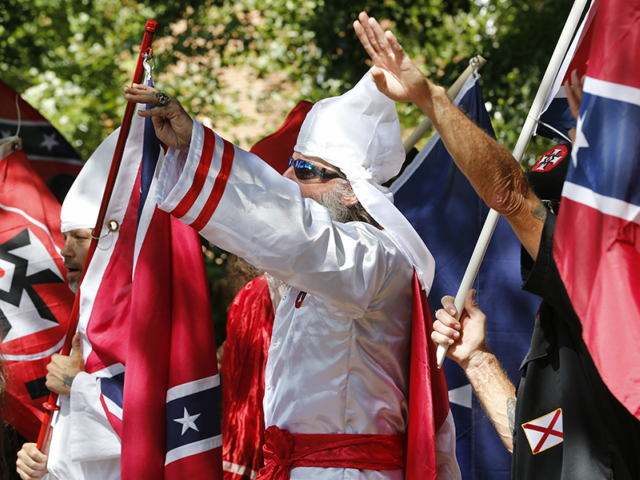 While white supremacists have been using banners for some time, the number of banners deployed in the past ten months marks an unprecedented trend, according to new data from ADL’s Center on Extremism. According to the Orange County Register, the Patriot Front, Identity Evropa, and Orange County-based Rise Above Movement were involved with placing the banners throughout Southern California. “There’s no question that the positioning of these banners was intentional,” Joanna Mendelson, senior investigative researcher for the ADL’s Center on Extremism, told the Register. The goal is to generate outrage — and boost recruitment. Some banners, for example, were reportedly placed in an area of Los Angeles that is home to some of the nation’s largest Jewish institutions in the country, including the Skirball Cultural Center, the Stephen S. Wise Temple, Milken Jewish Day School, and American Jewish University. Sometimes, however, antisemitic imagery and rhetoric are not draped across highway overpasses, but are featured in publications at liberal institutions. In October, the University of California Berkeley’s student newspaper published an anti-Semitic cartoon featuring former Harvard Law School professor Alan Dershowitz using Nazi-era imagery. The newspaper apologized several days later.